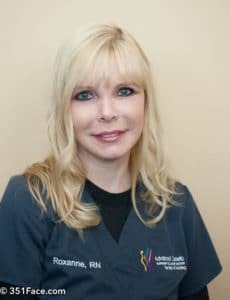 CINCINNATI, OH – December 5, 2018 – Roxanne Wise, a registered nurse with Advanced Cosmetic Surgery & Laser Center’s “Studio A” division, has recently obtained certification as a Certified Aesthetic Nurse Specialist (CANS) through the Plastic Surgical Nursing Certification Board. This certification requires a minimum of two years of plastic surgical nursing experience and at least 1,000 practice hours in plastic surgical nursing over a three-year period. She has worked since 2013 in the field of aesthetics, and joined Advanced Cosmetic Surgery & Laser Center in 2017, where she performs a wide array of facial rejuvenation and anti-aging procedures, including microneedlng, chemical peels and dermaplaning, as well as injectables such as Botox and fillers, as well as the Emsculpt and miraDry procedures. She also assists Dr. Mendelsohn in the operating room during surgical procedures. Wise obtained her Bachelor’s of Science in Nursing from Ohio University in 1997 and has a certification in Medical/Surgical nursing. In addition to her schedule at Advanced, she has also worked for the past 20 years as an R.N. at the University of Cincinnati Neuroscience division. She currently resides in Ft. Thomas Kentucky.